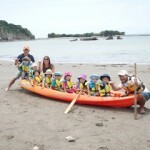 Children from the age of 2 to 6 years old (pre-school) are encouraged to learn together. Telacoya 921 does not have “whichever”,”anything is good”, “decide with janken”, “majority vote”. Children decide after talking with each other. 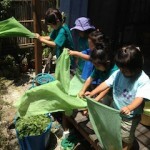 Since children have consulted and decided, they will take responsibility for themselves. If children ask for help, adults will help only the minimum requested. Adults tend to teach occasionally because there are so many things they know a little bit than children. Senior children decide on the strolls of everyday walks by discussion. For adults, if you think that this weather may be the sea and you are wearing swimsuits, but children may be decide to go to a mountain. For safety management adults are solid. 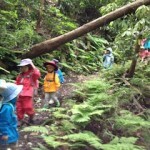 Children play with outside, taking advantage of the environment of Zushi and Hayama, while playing in the mountains and the ocean, with the power to think by oneself, the importance to cooperate with fellows, the health of the mind and body, and the important thing as a person naturally I will learn. Because it’s a convenient world, dare to enjoy inconveniences! Let’s learn in the nature that feels the four seasons! We value each person and protect the environment where children grow up. I will cherish the childcare that I will take out waiting from childcare giving. We try to keep day care which cherishes the experience unique to small people, such as hand making while always helping a little. Copyright © Telacoya921 All Rights Reserved.